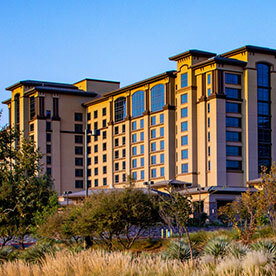 Cache Creek Casino Resort offers premier gambling, entertainment, dining and accommodations all in one location. Whether you are looking to kickback poolside or try your luck at Blackjack, Cache Creek has what you're looking for. Peruse our site map to familiarize yourself with all that our casino resort has to offer for your next getaway. Breathe excitement into your next vacation at our world-class casino resort. Whether you are celebrating a special occasion, testing your poker skills or wanting to create the ultimate staycation, partake in our luxury amenities, dining and accommodations in the beautiful Capay Valley. From a humble bingo hall to a now 415,000-square-foot resort, Cache Creek Casino Resort offers thousands of slots and over 100 different table games. Perfect your golf game at the award-winning Yocha Dehe Golf Club, pamper yourself with a luxury massage at our new spa, or relax by the pool while sipping a cocktail from the poolside bar. Be front and center for amazing concerts, hilarious comedians and amazing performers. Enjoy live entertainment while dancing the night away. Check our event calendar and grab your tickets before they sell out. From quick eats to golf course dining with breathtaking views, Cache Creek Casino Resort offers ten on-site dining options to cater to all cravings. With full-catering and banquet facilities, it's also the perfect location for a business retreat or to tie the knot. Have questions about your next vacation to Cache Creek Casino Resort? Contact us.